Acoustic Energy Reference Series gets three new finishes | What Hi-Fi? Following demand from customers, Acoustic Energy has added three new finishes to its flagship speaker range. The new finishes include Piano High Gloss Black, which is available for the Reference 1, 2 and 3. The Reference 1 gets an additional two finishes: Satin White and Piano High Gloss White (pictured). The new finishes are available in addition to Piano Ebony, which was previously the only finish available. Matching Reference stands are now also available for the Reference 1 and 2. To celebrate the release of the new finishes, Acoustic Energy has announced some special package prices on speakers and stands. The Reference 1 speakers with matching stands can be yours for £1600, saving £275. 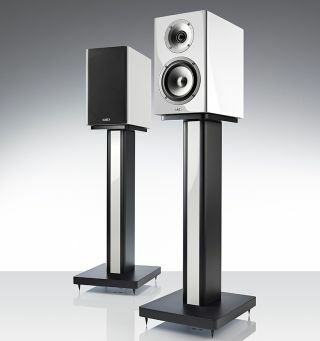 Meanwhile, the Reference 2 with matching stands will cost £2150, again saving £275. We reviewed the Reference 1 back in 2011 and deemed them to be “a terrific pair of small speakers” capable of delivering solid bass, good timing and a well judged tonal balance.